So this is a bit of a first, I didn’t have the pleasure of being at the Leigh Sports Village today, the home of Manchester United Women, I enjoyed the game against Tottenham Hotspur Ladies thanks to MUTV. The two sides have been the early pacer setters within the FA Women’s Championship. 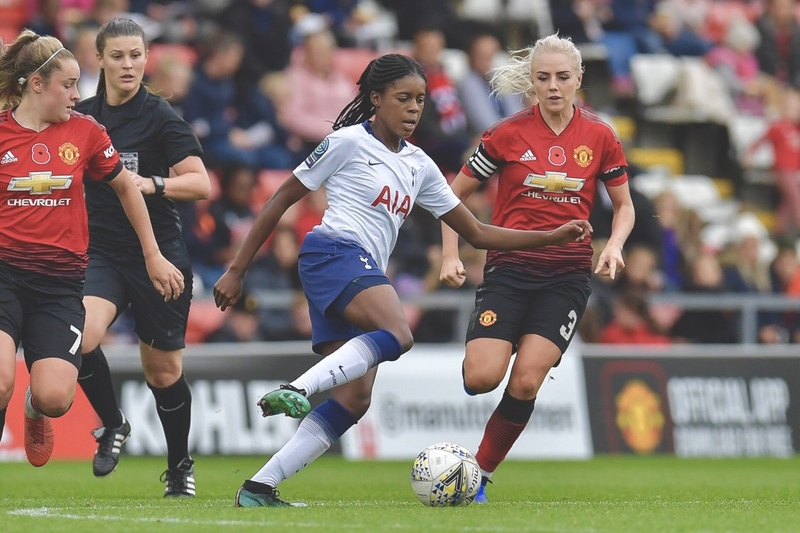 Spurs began the day five points clear in top spot, although Casey Stoney‘s side knew that a win would see them move within two points and a game in hand. Being a Manchester United fan in men’s side has meant that I have obviously been following the women’s fortunes as I have felt like I had to adopt them as ‘my’ team in women’s football also. Whether that’s the case or not is a debate for another day. Prior to the game, I felt confident that the full-timers of United should be too strong for Spurs and that was how it turned out in end. This morning I nearly tweeted that I felt that Lauren James would score first in a United win. I didn’t and now you’re all probably thinking I’m lying. That’ll teach me. Next time I’ll be brave enough to go with my instinct. James’ goal came after ten minutes thanks to excellent work from Jess Sigsworth. There was a role reversal when James turned provider and set up Sigsworth to tap in her low cross from the left. 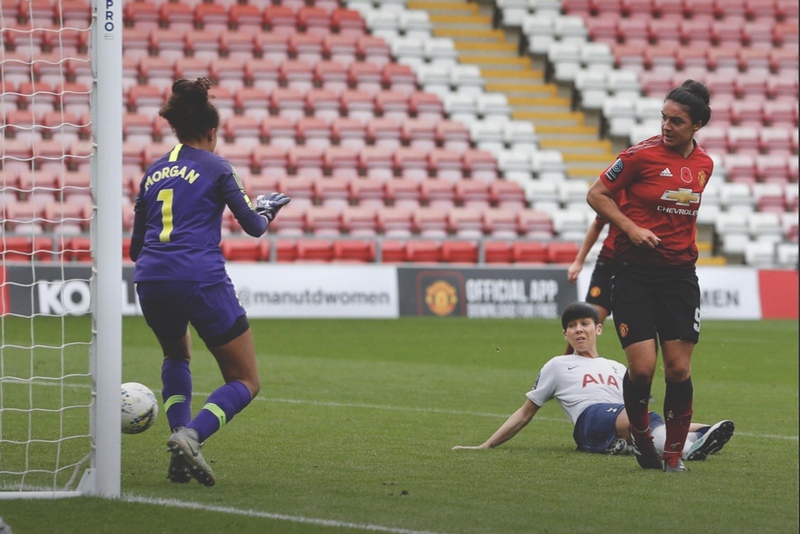 As the game settled Tottenham came into it more although couldn’t quite create a clear goal scoring opportunities and the United keeper, Siobhan Chamberlain, will have felt quite happy not to have been called into action. United went into half time 3-0 up thanks to Sigsworth’s second of the game. Katie Zelem’s great free-kick found Sigsworth at the back post and she headed in past Spurs goalkeeper, Chloe Morgan. Spurs came out fighting in the second half and Angela Addison was looking like their biggest threat. It was the former C&K Basildon Ladies winger that caught my eye when I saw her during a pre-season friendly against Chichester City Ladies. 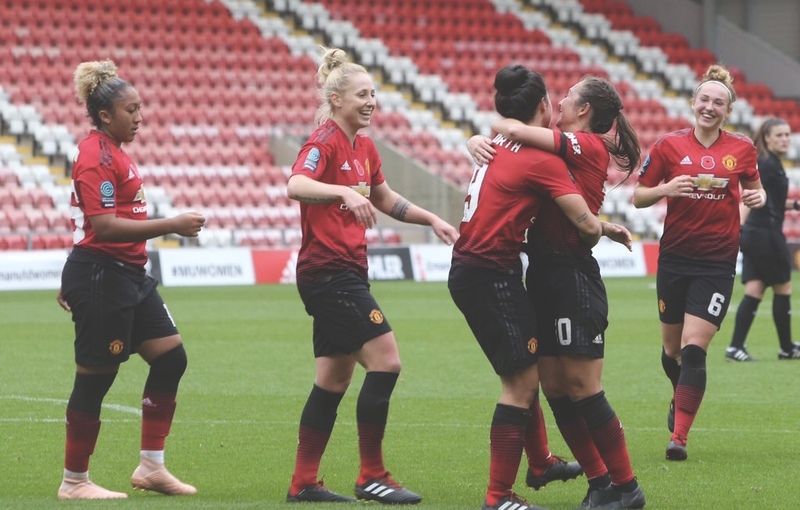 United’s pressure paid off when substitute Charlie Devlin scored her first goal for the club. Chamberlain was unable to keep a clean sheet when Angela Addison became the first player to score against her in the league, heading in from a corner in the 82nd minute. United looked impressive and will know that nothing less than a victory would have been a huge blow in their quest for promotion in their debut season. Roll on next month when I get to see the Reds play in the flesh when they come down south to play Lewes. Manchester United: Chamberlain; Harris, A. Turner, M. Turner, Greenwood (c); Palmer, Zelem, Toone; Hanson, Sigsworth, James. Subs: Bentley, Green, Galton, Devlin, Arnot, Hartley, Smith. Tottenham Hotspur: Morgan, Green, McLean, Hector, Wiltshire, Dean, Schillaci, Wynne, Addison, Naz, Neville. Subs: Gibbon, Leon, Meiwald, Haines, Baptiste, Vyse.